Seattle is getting snowed in. What to do when you wake up Saturday morning to find lots of powdery stuff outside your door? Go outside to play, of course! When snowbound Seattle days stack up, a general malaise can set in. Signs to watch out for include long stretches of boredom, mild confusion and intractable cabin fever. But the antidote is easy: Go outside! With appropriate bundling, urban skiing and sledding will scratch your outdoor-kid itch. Here’s where to make it happen. 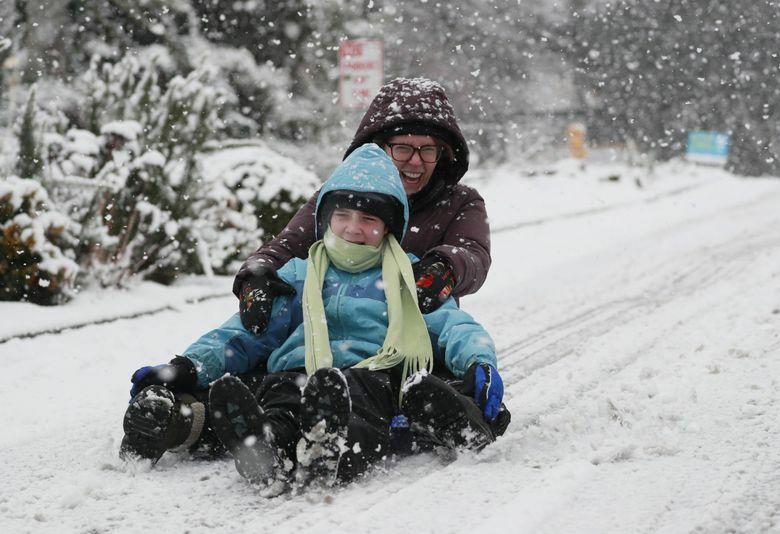 Sledding or skiing outside your house is a Seattle tradition. Chances are good the street where you live has already accumulated a small army of sled-toting families, teenagers and dog-walkers. 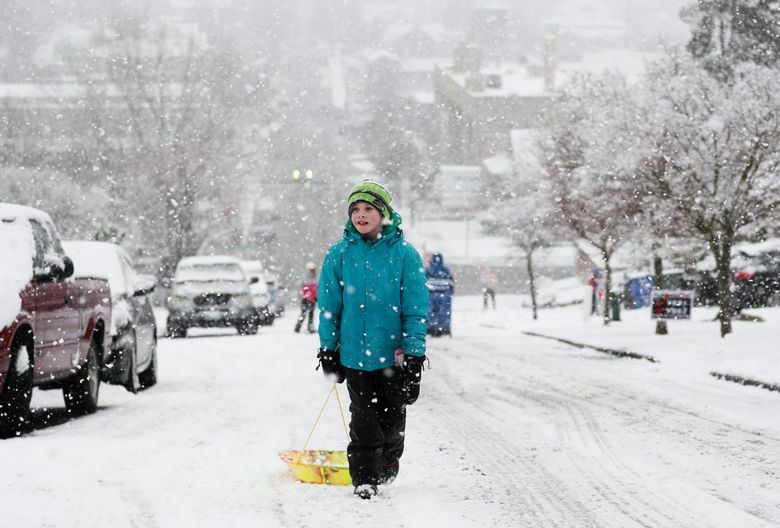 If you’re sledding on a busy street — even if it’s closed to traffic — be careful. Conditions can get icy and sledding into a parked car is a much worse fate than a case of cabin fever-induced loopiness. Pay attention to any vehicles in the road, make way for other sledders, and wait for pedestrians to get out of the way before careening down. Big city parks often have softer, more forgiving terrain than the street and, for parents, their lack of cars (parked or otherwise) can be reassuring. In North Seattle, Woodland Park is a classic spot for all manner of outdoor recreation in the snow. (When I skied through on Monday, I saw folks cruising downhill on bikes, homemade Frankensleds made of decommissioned skis and skateboards, and at least one snowboard.) In West Seattle, check out Lincoln Park‘s wooded beachside trails. Pro tip: Go while snow is still falling. Once it stops snowing and accumulated snow begins to wear away, you’ll lose cushioning (bad for falling) and the bare ground can be rough on equipment (see: rock skis, above). And don’t overlook the majesty of snow-covered golf courses. There’s a reason golf courses in snow-prone areas are often groomed to double as cross-country ski trails during the offseason. The Jackson Park Golf Course between 130th and 145th St. and the Jefferson Park Golf Course on top of Beacon Hill won’t be groomed — we’re not that kind of city — but they’ll still offer plenty of relatively low-stress terrain for skis and sleds. And if none of these appeal? Get out and shovel your sidewalk. Your neighbors will thank you for it. What are your favorite places to ski and sled in Seattle? Let us know in the comments.